The poem consists of 10 lines total, in a 3-3-3-1 stanza distribution. Each line is 9 syllables long. No meter is required. The lines do not rhyme. After each three-line stanza comes a list, in parentheses, of three words taken from one of each of the lines in the preceding stanza. The poem is dated and addressed to a specific person (someone you know or someone you don’t). Since I do not enjoy such formulaic exercises, I developed my own approach, based on DLB’s prompt to use random articles from Wikipedia, in which each line comes from a different article used in the order they were found. I kept to the language of the article rather than paraphrasing or /interpreting improvising from it and cited the title of the article in italics at the end of each line. BTW: I admit I am no math genius, but I do not understand the 3-3-3-1 when ten articles actually would produce an even number of lines, given the formula. So, WTH, I offer instead a 3-1, 3-1, 3-1 = 12 lines. Plus a day late, again. Sigh. Once again a day late. Since I found the challenge in the Found Poetry Review forced me to admit how poorly I understand that kind of ‘computerspeak,’ I turned again to NaPoWriMo.Net. Here’s the prompt from Gloria Gonsalves: Write a poem in honor of Earth Day, which led to two poems. 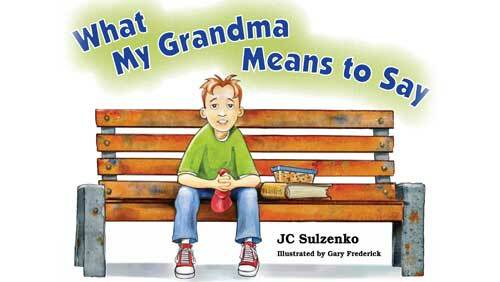 The one below and on the page “For Readers”, click on “Read this to a child,” you will find a ditty for my grandson. I wish I could save her, single-handed. She’s so lovely, so delicate, at least what I perceive. than I can master on a given day. just the guts to do something for her. scrape at her beauty in the name of booty. now everything’s for profit, her nature forsaken, too. She deserves better, but I don’t know what to do. So shame-faced little me does gutless nothing. Today’s prompt through NaPoWriMo.net comes from Vince Gotera, who suggests a “Kenning” poem. “Kennings were riddle-like metaphors used in the Norse sagas.” Definitions: “A Kenning is a two-word phrase describing an object often using a metaphor. A Kennings poem is a riddle made up of several lines of kennings to describe something or someone.” The structure: Several stanzas of two describing words. It can be made up of any number of Kennings. Amusing and surprisingly difficult. Here is a poem made up of Kennings that relate to two different subjects. Can you guess what they are? Let me know. This is an interesting challenge, which I only tackled in part. First I provide the text from which I removed articles and nouns, plus a few other words, to come up with a short ‘translation’ of sorts. I will bank this approach for future consideration when the pressures of time are less. The black Bakelite phone rings, once, twice. My mother always answers on the third brrrring! “Ya, vie gehtes; ya, alles ist in ordnung. that’s how a l—–o—–n—–g conversation begins. which makes me feel as though I’m not there. I understand what’s going on. and cannot now, I could speak it well. Aber ich vill night is what I would say. I refuse to talk German on command. That’s when I pick up the extension down the hall. I muster as polite a demand as I can. and then she turns to me. The prompt from Jeff Griffin took me to the 2015 Griffin Poetry Prize Anthology. As suggested, I read it through and transcribed chronologically and without punctuation what words or phrases I found “remarkable.” I then copied the text into Google Translate through a cycle of 5 different languages and then back to English. I’m afraid the chronology and substance of what I first noted remained more or less in tact in spite of Jeff’s prediction of translations going awry. Perhaps I was inept at the process. Would not be the first time. The poem below uses unaltered words and phrases which keep faith with the order in which I noted them originally. which did not heal with time. Instead of the April 16 prompt from The Found Poetry Review, which may have provided a constellation of possibilities to others but left me cold, I followed, instead, the optional prompt for April 17 from NaPoWriMo.net, which both intrigued and amused. with death by pheon and crossbow. It’s otiose for me to argue, I know. I turn remontado and disappear. Joel Katelnikoff’s prompt took me to the reading list my book group set for 2015-2016 over my own objections to a sole focus on fiction and non-fiction related to Canada’s aboriginal or indigenous peoples. I felt the weight of the choices but read the books, on occasion with gritted teeth. What follows, then, is my take from those sources on finding “love within what we hate,” which to be honest surprised me. In this partially found poem, I’ve used the actual titles of books, exhibits and reports that I’ve experienced. They appear in italics, and I can supply footnotes, as necessary. to show Truth and Reconciliation as necessities. or from the Métis Nation: Hiding in Plain Sight. over settler greed and duplicity. Never thought of myself as a colonizer before. though they might not self-identify as such. Extraordinary because they were here first. Well, it’s not ‘magic’ that characterized the firsthand experience captured in the piece, below. Again, a day late. Papers come out of my ears. More than I imagined all over the carpet. Raked charge card slips, bills, receipts, form into neat, little heaps just days before the deadline! Still cross- referencing, double-checking, collating, misplacing what I’ve just seen, I have to dig for it. Rather be doing anything else, except visiting the dentist. I pay my accountant through the nose to submit my return. A relief, frankly. Though I wish I could give him the piles as they are, let him work his magic in that high glass palace. Though I’d have to pay double, which would piss me off. Instead, I struggle to hold onto the string from where the story of each category begins before the whole darn shebang unravels, and I have to start from scratch. En route, I slice fingertips on sharp sheets and bleed, and then I mis-staple till I figure out a stack’s too thick and use a clip instead. That’s expensive, too: I use coloured ones, ‘cause ‘silver’ clips stick like rust, make me cringe as if I had chalk on my hands. Only then do I assemble the still-fluttering papers and stuff them into a giant envelope with a blank cheque, dated April, owing. Of course, a variation appealed more than the strict letter of the prompt. What follows is a poem drawn from words and phrases found in the winter 2016 magazine of the Canadian Automobile Association. 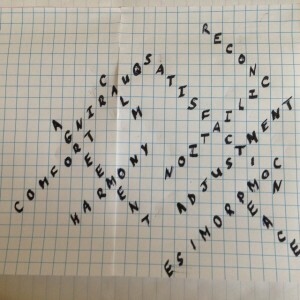 Each found word or phrase is non-contiguous and so appears on separate lines. Oh dear. Another day late. Well, can’t be helped. Here is the prompt from Robert Fitterman, borrowed from Steve Zuttanski: “Collect found language from individuals who articulate how they feel, specifically, in their bodies…physical symptoms in the body (neck, head, stomach, feet, etc). Use at least 20 different posts from different speakers. Modify, arrange, modify.” Which I modified, as you will see below. Fell off the wagon yesterday (April 10) and didn’t write a poem in response to Found Poetry Review’s prompt. Perhaps will have a chance to catch up later today. Perhaps not. What came to me were distinct ‘verses,’ using the syllable discipline of the tanka form and relating to the same TV broadcast, parts of which I remember, though not all of it. A two days’ supply of life. the characters in that play? as their world, their lives collapse. at how being trapped would feel. Simone Muench suggested the following prompt: “write a cento that is a self-portrait, or anthology of your life, utilizing lines and fragments from your own work,” an intriguing and somewhat daunting task. as cardinals sing a requiem among apple blossoms. like the ice that coats trees when you thought it would rain. in a way both welcome and not. Here’s Garnett’s response to Sarah Blake’s prompt in the Found Poetry Review Impromptu series for National Poetry Month. She suggested choosing a song and having its dynamics open the door to a poem. The song Garnett chose is Carole King’s “You’ve got a friend, ” which Garnett sang and read until this poem happened. Perhaps Garth Brooks will be taken by the lyrics and turn them into his next hit! LOL! So I ask, “is it still pourin’? Are the streetlights all on? Do they shine up the pavement? Ain’t they pretty”? The prompt from Woody Leslie involves meanings that have multiple words. He said “write a word, make list of other words related to it, combine these words into a woodblock sharing letters, keep rearranging, adding or subtracting words till you have a woodblock you like aesthetically both visually and linguistically… it can stand alone as a one-word poem or…. )” Garnett began with one word: ‘reconciliation.’ This is what resulted. couldn’t cope with such colour. 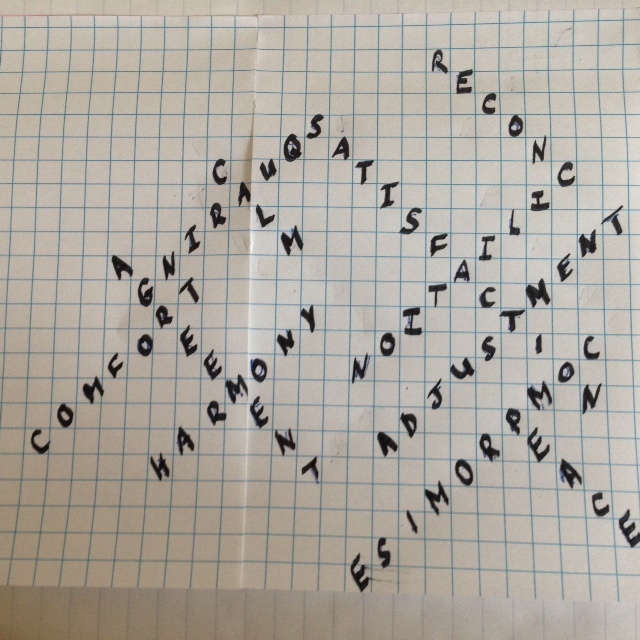 While the idea was to dissociate the letters and come up with a visual interpretation/imagery that departs from the word, here’s what happened to me. Having chosen the word ‘kaleidoscope’ and having stared at it for quite a while, I found the components of the word suggested the lines above. I also tried to import a visual to add a view through the instrument as background, underneath the words, but couldn’t find a way to do that. So the short piece above appears untitled and unadorned. And I used the syllabic discipline of the tanka, BTW. Prompt: go to an ad, take out the nouns and add others as you will. Starting yesterday, (yes, is a day late, explanation to follow), JC, using her pseudonym A. Garnett Weiss, will follow prompts from the Found Poetry Review (FPR) to create a poem a day during National Poetry Month. She intends to post them on this website at a minimum. “What can I say? I am a luddite and have as yet to figure out how to participate in this challenge on FPR’s website, except by adding the poem to my ‘what’s new’ page each day,” she sighed. “That’s why I’m a day late starting out.” She sighed again. JC delighted in announcing the winning poems and identifying the poets who entered the winners’ circle at the 21st Awesome Authors Awards ceremony on March 29 at Centrepoint Theatre, Ottawa. Then she shared her decision to step down as English poetry judge after more than a decade of serving in this capacity, for which the Ottawa Public Library (OPL) awarded her the Order of Friendship in 2010. “I love the contest and will remain its biggest fan,” she promised. She asked everyone who had submitted a poem to the contest in English or French or English and French to raise their hands and declared it awesome that so many emerging writers aged 9-17 had the courage to do so. In the autumn, winning poems and short stories will be published in the anthology, Pot Pourri. 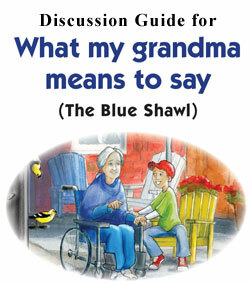 Copies can be ordered directly from The Friends of the Ottawa Public Library. To honour the poets who won awards this year, JC has created a cento (pronounced ‘sento’), a form of poetry, which uses lines or parts of lines written by different poets and combines them into a poem, which is new in form and meaning. JC (often writing as A. Garnett Weiss) is focusing now on this form, and a number of her centos have been published and won awards. Ask me anything you want takes lines or parts of lines, unaltered from how they appeared in the winning poems in this year’s Awesome Authors Contest. The gloss links to the source of each line, including the title of the poem and the poet’s name. if only they could be heard. a mixture of your blood with the waters. However no one can know except for you and me. no one understands who we are. Go to Bookends and read JC Sulzenko’s review of journalist, broadcaster, musician and activist Kinew’s 2015 “The Reason You Walk,” written in part as eulogy, in part as catharsis. 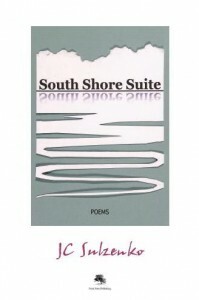 California’s Silver Birch Press (SBP) features Garnett’s recent poem in its new Same Name Series. The poem, based upon Garnett as an undergrad bumping into Leonard Cohen at a university library, goes beyond that moment to capture her evolution into a fan. “I am honoured to be included in this innovative series and thank the editor for choosing this poem,” Garnett states. The past has a habit of not only of catching up but also of having a future. A few years ago, JC Sulzenko began interviewing people whose choices about what to do and who to be in life interested her. In many cases, she spoke with friends and acquaintances. She also sought out strangers in lines of work she thought could offer possibilities for reflection and subject matter for her poetry. Her purpose: To assemble up to forty ‘portraits’ as the basis of a volume of poetry which would capture what she learned and from which she could draw out the essence of her subjects through free verse. She met with more than two-dozen individuals and wrote poems arising from each of these discussions. Several poems appeared in such publications as Maple Tree Literary Supplement and various volumes of The Saving Bannister. That is until Silver Birch Press offered her the chance to have 15 pages of thematically-linked poetry included in its 2015 chapbook anthology, “Ides,” which was released on October 16, 2015. Published under her pseudonym, A. Garnett Weiss, “Cameos, appearances” features poems informed by the lives of a doctor, a puppeteer, a passenger train engineer, an adjudicator, a jewelry artist, a librarian, a lyricist, a friend, a teacher, a composer, an innkeeper, a chef, a volunteer and a naturalist. The collection is available from Amazon.com at a cost of $ 15. Today, Silver Birch Press has featured “What’s in my name” by A. Garnett Weiss in its ALL ABOUT MY NAME poetry series. The poem and additional biographical and explanatory notes reveal choices JC has made to govern how she is called and calls herself. “Yes,” she admits, “I have multiple identities that serve my purposes well, professionally and personally.” I enjoy being whoever I am at the time! Garnett is delighted that the magazine’s editor has chosen “Hesitation marks” for the poem of the week. This poem first appeared in Vallum among the selections on the topic of speed. Silver Birch Press has been running an amazing series with the theme of “Me as a child.” The quality, depth and variety of poems which have appeared to date bring the series into the realm of ‘spellbinding’ reading.